Hanoi (VNA) – Hanoi is very keen on cooperating with Singapore in tree landscaping designs and tree trimming technology, Chairman of the Hanoi People’s Committee Nguyen Duc Chung has said. 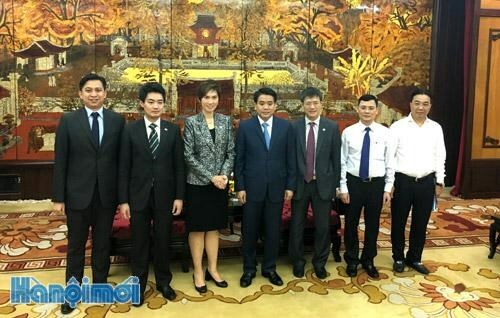 He made the statement during a meeting with Josephine Teo, Singaporean Senior of State at Prime Minister’s Office, the Ministry of Foreign Affairs and the Ministry of Transport in Hanoi on July 20. Briefing the guest about the city’s plan to build additional 25 parks to become a city of million trees by 2020, Chung expressed his hope that support and advanced technology from Singapore will allow the city to have new green look and better urban landscapes. He introduced the city’s urban development projects on building new urban areas, setting up high-tech system in controlling public transport vehicles as well as constructing roads and bridges. Hanoi is a safe destination for both tourists and investors, Chung noted, pledging to deliver maximal help to foreign investors, including Singaporean businesses. For her part, the Singaporean official affirmed that her country always supports cooperation projects between two nations and those with Hanoi.